A few tickets are still left for this illustrated talk on Wednesday 20th April, celebrating the 90th birthday of The Queen. Our Chairman Richard Poad will start with a swift gallop through the royal connections in Maidenhead history before concentrating on visits to Maidenhead and nearby villages by the Queen and other members of the royal family. Venue: Maidenhead Heritage Centre at 7.30pm. Tickets £8 (£6 for Friends of Maidenhead Heritage Centre). Phone 01628 780555 for tickets. Our exhibition THE CHANGING FACE OF MAIDENHEAD is now closed, replaced by THE STORY OF SKINDLES. Inspired by the discovery in our archive of 190 photos of Maidenhead shopfronts taken in 1984, the exhibition lookED at the changes to Maidenhead’s central shopping areas over the last 30-50 years. 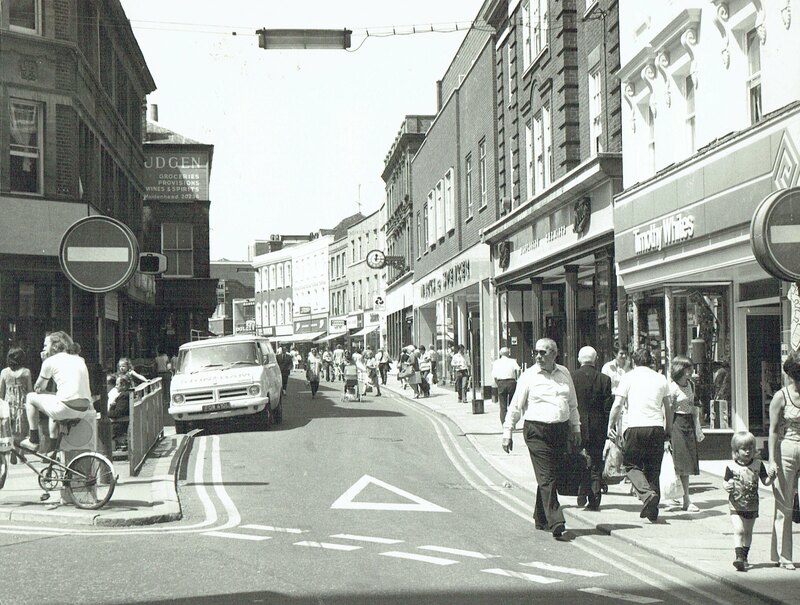 Photos of High Street jammed with traffic show that by the late 1960s, something had to be done – which led to the pedestrianisation of High Street and the construction of the Nicholsons Centre. With the shopfront photos arranged into panoramas you can stroll up High Street and along Queen Street and see the type of shop you have forgotten ever existed. Fishmongers, butchers, greengrocers and even a Wimpy Bar have all disappeared. In Market Street a pub is the only building left over 40 years old, and King Street has been equally transformed. The exhibition endED with a glimpse into the future, with artists impressions of the Chapel Arches scheme (under construction) and The Landing (no start date announced).